I do not know how you feel, but it is my impression, that eBay has gone from a good site to buy stuff to a run down flea market. Here in Germany you either find professional traders that sell for the same price you can get in any brick and mortar store or people who try to get rid of their trash using the 1 Euro auction (and relist it every week until it sells). So my eBay account has gone mostly unused in recent month. So what a surprise that I actually bid (and won) on 6 auctions this weekend. I started on Saturday with two Black Dog upgrade kits. These are 1:48th scale stowage for modern US vehicles and should come in very handy with those Hummers and Strikers I am doing at the moment (and maybe if there are some leftovers add to my already finished USMC vehicles). Next up on Sunday was a die-cast Spürpanzer Fuchs. Now it took me well over a year to get this one three times. When it arrives, all three will be disassembled, converted into the transport version, repainted and finally complete my modern Bundeswehr force. And last but not least, I got three 1:48th scale WWI bi- and tri-plane kits. Two German and one Australian. While I was not in urgent need for these, they were reasonably cheap and came from one seller (saving me additional shipping). So what is on my table right now? Well I am working myself through another unit of Prussian Landwehr and finished the bases for the minis I showed you last week. 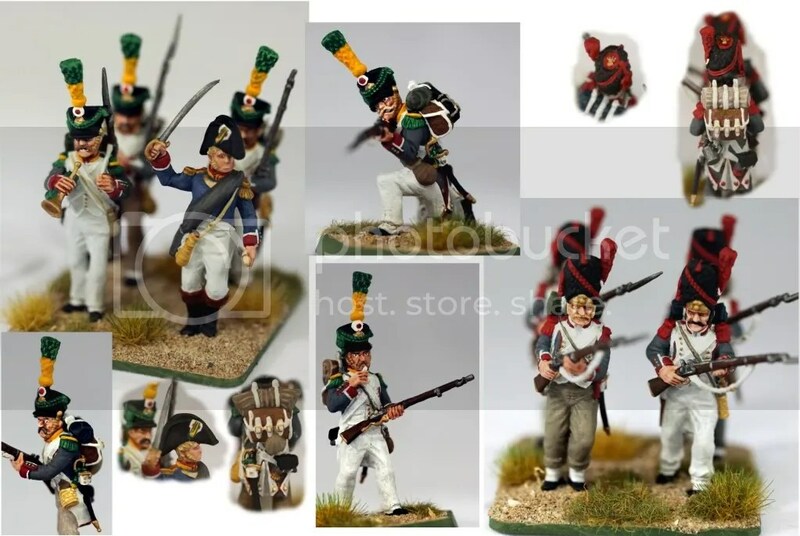 So lets start with a French Brigadier (the Prussian Feldjäger will be added this week). The officer is from Victrix. 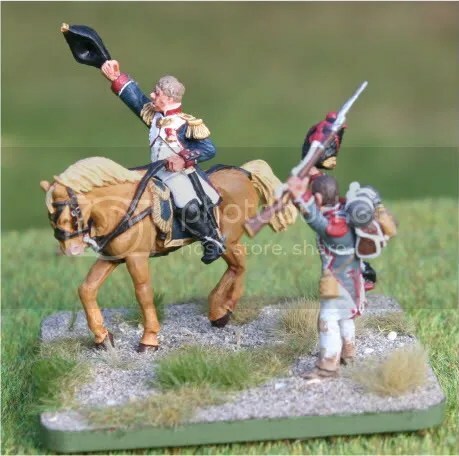 I painted him up in 2009, this actually being my very first Napoleonic mini. Back then I had planned to make him a regimental officer and put him on a base in a infantry unit, but in the end decided against it. So he lingered around for almost two years now until I decided to base him up as a Brigadier. The other mini on the base is the converted grenadier from last weeks post. And while we are talking about it… this is the unit he was meant to be part of. 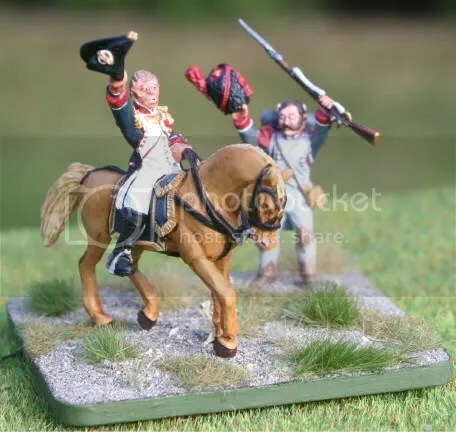 This is my first Napoleonic unit I painted, started in 2009 and only finished 8 month later in 2010 due to me working in the south of Germany during that time. Minis are all Victrix. This one is meant to be a generic unit and does not depict any specific unit for a specific battle. Sorry for the strange photo format… these pictures were originally edited for the Steve Dean Painting Competition, where they failed miserably. So stay tuned for the Feldjäger posts! While I had been planning to show some pictures of the finished bases for the Napoleonic models from my last post today… well they are not finished yet. But I still felt like posting something, so I took a look around and went for some of my favourite WWII models. These were actually done in 2009 and they hold a special place for me, since these were the first models to get me into the main group of the Steve Dean Painting competition. The jeeps themselves are die-casts from a German company called Schuco. These were converted using parts from Victory Force miniatures. These included the wire cutter, MG´s, radio and stowage. They were then repainted and dirtied up using my airbrush. The crews are from Victory Force as well. As far as I know those crews were meant for Corgi models but they just fit like a glove. Those small US flags you see on the windscreens are decals. When the jeeps (and other vehicles for that matter) were readied for the invasion of Normandy they got these stickers, which included waterproofing instructions and a checklist on one side and had the US flag on the other side. Some crews removed these when on dry land, others left them. I felt that these would be a nice touch, so I added these. These Jeeps were painted in one go with three half-tracks and I will try to take a few pictures of those to post them here soon. This is actually the third time I have painted the “Black Watch”. The first time was for a Sci-Fi game called Battletech, but those minis were sold off almost a decade ago, when I turned my back on Sci-Fi. The next one was a mechanized platoon for my modern troops that I did in 2002 or 2003 and they are still performing a stalwart service. I guess I will have to take a few shots of these in the near future and post them as well. Now these guys were begun late last year, with about a third of them being painted this side of New Years. 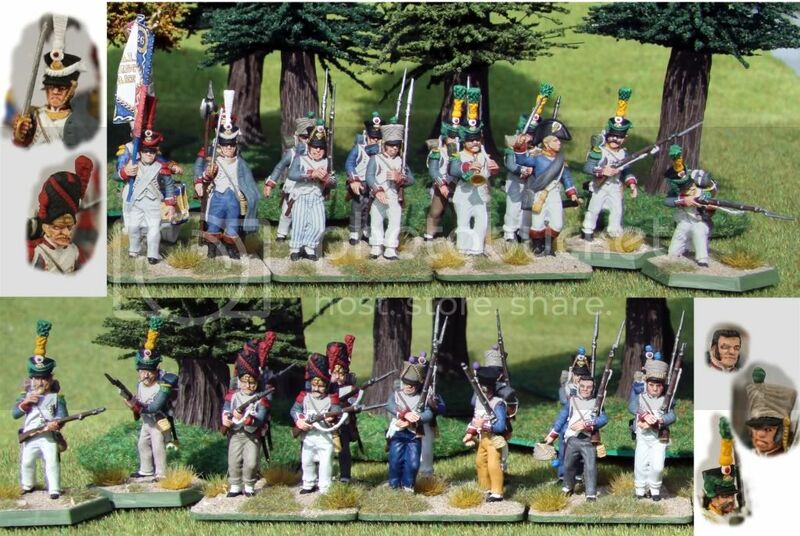 They are meant to represent the Regiment at both Quatre Bras and Waterloo. To this end, I simply painted enough for the former and will simply remove stands when playing the later. The minis are all Victrix. They are great for this purpose since I wanted to bases to look like the men have formed square. 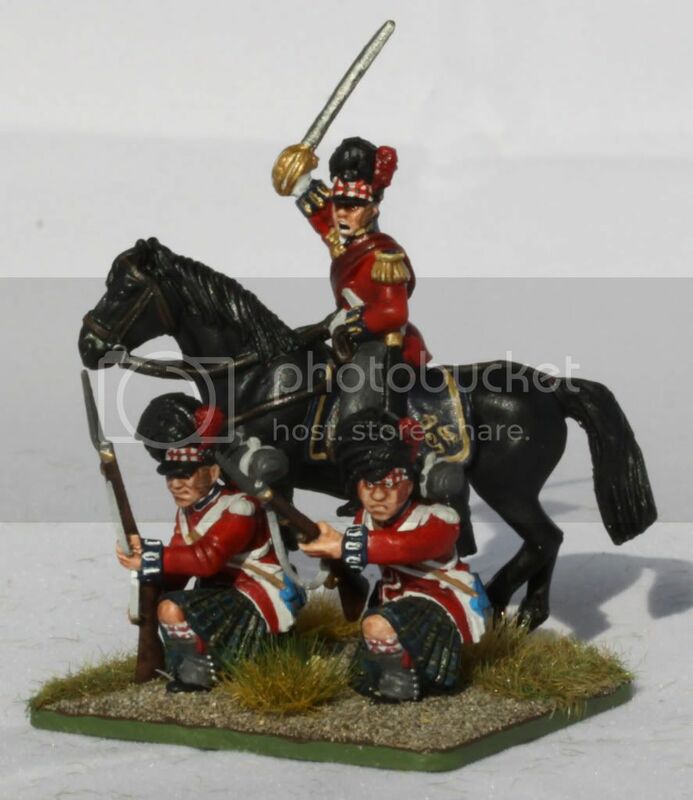 So I needed a kneeling front rank and a rear rank in firing or loading poses. The Victrix sets gave me all that. The big downside were the kneeling minis. 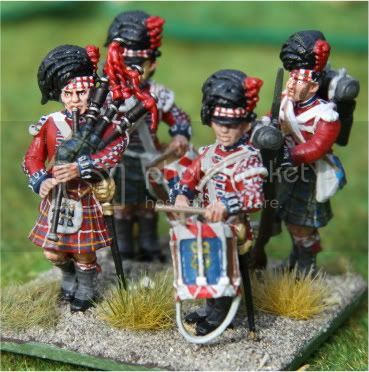 Had I known beforehand how *bleeping* hard it would be to paint a tartan pattern on their kilts when you can hardly get the brush in between their arms… well I would have settled for marching poses! 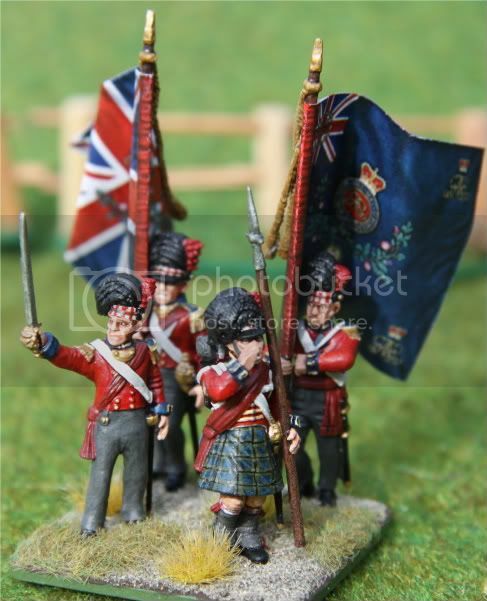 As one might see, this regiment has always held a special place in my heart, so I knew by hard, that the hackles on their bonnets did not have the standard colour coding. The one thing that gave me headaches were the kilts. While the regiment is supposed to wear Government pattern tartans, some sources say, that the grenadiers had red stripes added to their pattern. 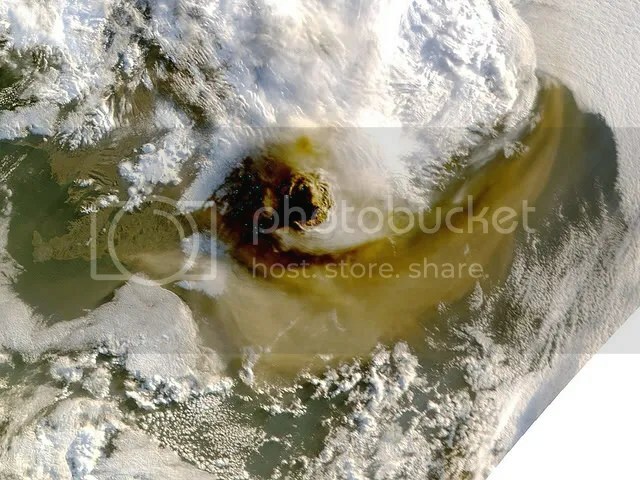 Since these sources were the minority and I could not find a clear timeframe for this practice, I decided not to do that. One the other hand a good number of sources say, that the pipers wore Stewart pattern. While it was hard to verify this or not, I decided to simply do it. The piper was in my last batch of 4 minis together with the mounted officer and ensigns and by this time I was so sick of the government pattern, that I simply needed a break. As you can see from the different backgrounds, these shots were taken in two different sessions. If like either better (white background or scenic background)… please tell me. I will try to keep this in mind for future posts. By the way… these minis were entered into the 34th Steve Dean painting competition. They came second in their group, which meant they advanced to the main competition (only the second time ever one of my entries did so). Unfortunately they were then kicked out in their first match-up. Which was no big surprise, since the quality of the 34th competition was amazing. So I am glad I even came this far!